Tenet. We are empowered by our feminine nature and biology, and we honor our procreative power. Tenet 5. We are empowered by our feminine nature and biology, and we honor our procreative power. As women, we are distinct and different from men. Our contributions, however, are equally valuable and essential. It is with confidence that we claim and embrace our unique feminine nature and biology. We believe that every woman who has the best interest of the rising generation at heart, and willingly gives of herself to nourish and protect the rising generation, is a mother. Whether or not we choose or are able to bear children, each of us is born with the potential to create human life, and this is of monumental importance. Unlike males who constantly generate sperm after puberty, girls carry within them their only supply of eggs before they are ever born. Miraculously around the age of 16-20 weeks pre-birth, a young female baby caries up to 7 million eggs in her tiny body. This tiny baby, protected and housed within her mother, likewise houses and carries within her the perfectly formed blueprint for an entirely unique and amazing new future person. In essence, every time a woman is pregnant with a baby girl, she is in fact carrying life into a third generation. This is a beautiful manifestation of our matrilineal power! Yet in many countries the birth of a baby girl results in female infanticide, so much so that the census ratios in such countries between men and women have been increasingly distorted. Dowry systems and other cultural practices place a cheap dollar amount on a young girl who is in fact of infinite worth. Because so many traditions do not value the power of the female body, we can be a voice for the millions of lives lost. Regarding our natural shared experiences with menstruation, we share awareness that it is neither bad nor shameful, but is vital for the empowerment of women and girls across the globe. Simply put, menstruation reveals that our bodies are functioning correctly and have the potential to create life. As powerful as this reality is, in many cultures throughout the world, this healthy biological manifestation is interpreted as evil, or unclean. Girls and women are shunned from their rightful place within their homes, schools and society. 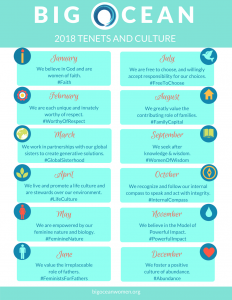 As we collectively claim and embrace our identities, we will begin to change the many negative cultural stereotypes associated with our bodies and this procreative power. Once a woman chooses to become pregnant and create human life, her body again accomplishes a great work by generating an entirely new organ, the placenta. It literally functions as the baby’s digestive system, immune system, kidneys, liver, skin and lungs for the first 40 weeks of the baby’s life within the mother’s body. The creation of the placenta is a laborious accomplishment and a considerable work in and of itself. Many cultures like Maori of New Zealand, the Navajo native Americans, and the people of Turkey and Malaysia so revere this organ that they give it a ceremonial burial. In parts of Bali, the placenta is believed to be the physical body of the baby’s guardian angel and is therefore treated with the utmost care and respect. Science is recently discovering just how incredible the mother-child connection is. Before the baby is born, its brain development is largely shaped by the sensory exposure to the mother’s voice and emotions. Once the baby is born and up until the 19th month post birth, the mother acts as a buffer to the outside world. A study claims that the mother acts as the newborn child’s brain stem, processing all external input through the mother first. Science is also discovering the power of a strong emotional attachment between a mother and baby. Studies have shown that healthy attachment may help prevent diseases, boost immunity, and enhance the baby’s cognitive development, not to mention many other emotional and psychological benefits. Women are biologically attuned to nurture and give care to the rising generation. Lactation is yet another powerful example of a woman’s unique capacity to provide life-sustaining nourishment while also building emotional and spiritual bonds with the baby. The nurturing gifts possessed by women allow us to expand our reach outside of our own families to encompass others in what Shakespeare called “the milk of human kindness.” In some instances, this outreach is expansive, as exemplified in the life of such women as Mother Teresa. Big Ocean Women honors our feminine power and potential to create human life. We understand the significant responsibilities connected to this procreative power. We seek to create a culture where women and girls, as well as men and boys, respect this power with the utmost care and sensitivity. We promote and practice self-governance, and nurture our bodies with respect. We neither sell nor relinquish our capacity to create life, and we invite all men to do the same. We teach our daughters and sons to promote and uphold virtue. This is key to ending false traditions of female degradation and violence. Cultural and/or institutionalized violations of these principles, whether self-inflicted or other-imposed, will result in worldwide cyclical violence and pain. The ideology that we can transcend our biologies with no negative consequence to ourselves and others will ultimately result in the further commodification of the natural world and all organic life on the earth. What are the effects of women using their nurturing gifts outside of the family? What are ways that grandmothers, mothers, and girls, can support one another as women? How can you share the message that grandmothers, mothers, women, and girls are special and extremely valuable to society? What ways can you celebrate this truth with your community? What ways can you help end discrimination against women in your community? In what ways does this tenet validate your life and elevate womanhood and motherhood? Click HERE for more information about this tenet.